You love it. You ride it. But you've never had a chance like this before. 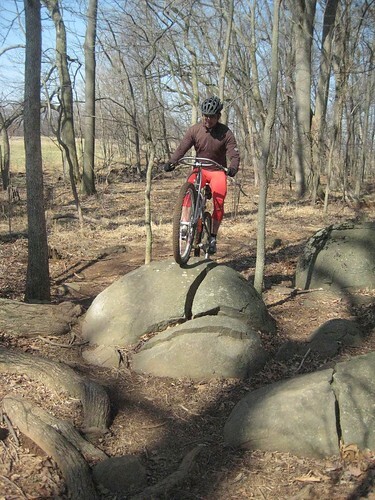 How about cutting 1 mile of new legal singletrack in the Frederick Watershed? MORE and PATC have been working with the City of Frederick to get permission build a big chunk of new trail to replace an old road bed that passes it self off as a trail. The current trail is an eroded scar that is 8 - 10 feet wide in places and filled with water bars and check dams. The new trail will be singletrack that contains a mix of rock gardens, bench cut trail, loamy soil and will go through hardwoods and mountain laurel. We want to get at least 40 workers out on Sunday April 5th to put a major dent in this project. That's a lot of people but this is a major opportunity to show the City what we are capable of building. Building a mile of trail is tough work, doing it at the Watershed is even tougher, that's why we need a big turnout to get things moving quickly. If you want to work but can't make it on Sunday a smaller crew will be going out on Saturday April 4th to do some corridor clearing and get the site prepped for Sunday's army of volunteers. We welcome help on either or both days. Please RSVP so we know how many people to expect each day and can plan accordingly. Why is this such a big deal? Until now, authorized trail work in the Watershed has been confined to doing band-aid style fixes on the poorly laid out blue trail, fixes that should be large reroutes due to poor trail alignment. This is the first time the City has given the OK to build a major chunk of new trail. We have a cycling advocate on the City staff that is very much behind this project and has helped push this through, setting a good example with this pilot project will lead to more opportunities in the future. This project will take place between Sand Flats and Fishing Creek Road. You can see a map of the reroute here. We are working on a food and beer supply for the workers. Stay tuned. Also, if you work at a bike shop or some other business that would like to donate cash or swag to help us feed our workers or reward them for their hard work please contact me at riderx@singlespeedoutlaw.com. We will make sure everyone knows your business helped us with this project. Thanks! Gloves, water, snacks, sturdy shoes. If you've got tools, we might need extras so we could use: shovels, picks, loppers, McCleods, rakes (mark you tools so you can identify them). April 4th and 5th, 9:00 AM - arrive a bit early if you can so we can do our start our safety talk at 9am, then we'll be car pooling to the work site since there is limited parking where we will be working. Sand Flats gravel parking lot. Gambrill Park Rd, approximately 3 miles north of Hamburg Rd. Directions from the I-70/270 junction can be found here. RSVP for the Sunday work day here. If you want to come out Saturday, email any one of the addresses above. Frederick local and Trek pro Jeff Schalk won the NORBA cross country mountain bike race put on at Rockburn Park in Elkridge, MD this weekend. New web site CyclingDirt.org has an interview with him below. I must take issue with him calling this his first race of the season though. How could he so quickly forget his Single Speed Punk Bike Enduro victory? Another Frederick local, Steven Wahl took the Cat 2 win and my team mate from 24 Hours of Big Bear, Dan "The Kid" Atkins took the Cat 2 Single Speed victory. No interview coverage of them, but Frederick County local Jenny Lewis showed the boys what she was made of and won the Juniors 10 - 14 category. Props to Cycling Dirt for interviewing her and a lot of other amatuers and not just paying attention to the pros. And in other race news, the fixed gear guys from Adventures For the Cure are putting on a mountain bike race at Patapsco State Park this weekend (March 28th). I think the race is full right now but you can always go cheer people on. We've got a big trail work project coming up in the Frederick Watershed on April 5th. Stay tuned for full details. After closing out the official night riding season at Gambrill on Wednesday (in bare legs due to the 70 degree temps earlier in the day I might add) I went for the trifecta on the weekend. Three bikes, three totally different rides, quality saddle time. On Friday I drug a couple of locals north where we planted skinny tires on dirt roads in the Michaux state forest. Long steady climbs on deserted forest roads followed by screaming descents. The packed clay was soften by recent rains, just enough to force and extra effort to keep your the cadence you wanted. I was rolling on the trusty fixed gear Surly Crosscheck, maxed it out at 37 mph according to my pacer James. This was shortly before some prime Appalachia scenery, a creepy looking "town" David Lynch would have had a hard time conjuring up. Crumbling trailers, burned out buildings, fluorescent orange crosses in front yards and plenty of barking dogs guarding the high dollar real estate. I would have taken pictures but that might have triggered some sort of incident with the natives so I kept the camera tucked away. Despite the forecast for the weather to get warmer as the day went on, it didn't and we saw significant snow flurries on top of Snowy Mountain. Seemed quite appropriate. Dropped a 1000 ft. of elevation rather quickly on Swift Run Rd and it's serious ruts, bumps and craters. It kept things interesting, just like I like my skinny tire dirt road action. Despite the cold fingers, toes and frozen face, it was a good day of riding, not a crazy distance, just a couple of hours of quality saddle time followed by Chubbys BBQ. Saturday I planned to log some long miles on the MTB so out came the Jones and I dragged Ricky d on a south to north tour of the Watershed. No mechanicals and with just two of us we covered a lot of ground with very little stopping. 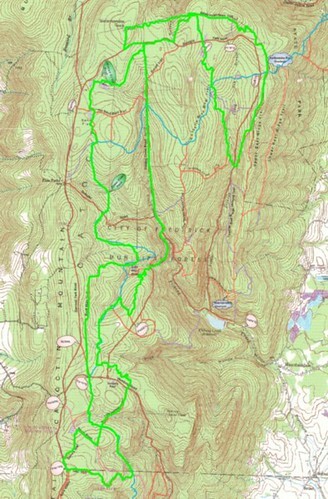 Trails were in good shape but the weather was chilly again. Not much you can do except dress properly - or try to since the weather people don't seem to be getting it right too often. After 4.5 hours of the rocky terrain the legs were properly worked. Bailed on an Elizabeth Furnace ride for Sunday, I've been looking to get down there recently but decided to stay closer to home and not burn the entire day by heading south. Looks like that ride got cut short with a hospital visit. Heal up quick David! Since my lady was headed to Schaeffer I tagged along to meet up with Ricky d for a quick "recovery" ride. Broke out the Vassago fixed gear set up and we cranked through Hoyles Mill and Schaeffer Farms trails for a couple of hours. Note to self: the 36x16 gear yields more workout than recovery after rocking the Shed all day before. Good fun was had, hit some tricky tech bits and the weather was sunny, warm and beautiful. Signs of spring are being seen in the woods and the first official day of spring just hit, but it's only the 3rd week of March, so the weather is probably going to pinball back and forth for a bit before the true warm weather takes hold. No matter, the good stuff is on the horizon.